I am always looking for new hair products that are moisturizing, designed for curly hair, and frizz fighters. I bought on a whim, Organix Renewing Moroccan Argan Oil products this fall at Costco and instantly fell in love with this brand. In the past I would spend a small fortune on salon brand hair products – my old favorites were Biolage, Pureology, and Moroccanoil. When I went back to work after having my son, I had to reevaluate my spending and I realized the cost of one bottle of Moroccanoil was more than a case of diapers! I absolutely love Organix products! I think the Moroccan Oil shampoo and conditioner is very similar to the Pureology Hydrate line, both products are sulfate free and extremely moisturizing. The only difference I found is price. The cheapest retailer I have found for Organix products is Walmart where the shampoos and conditioners are $5.74 for 13 fl. oz. and the moroccan oil is the same price for 3.3 fl. oz. Compare that to Pureology which runs around $30 or more for an 8.5 fl. oz. bottle or Moroccanoil Treatment (hair oil) that starts at $38 for a 3.4 fl. oz. bottle! Besides the enormous cost savings, I truly think Organix has a great line of products. My hair is moisturized, feels softer, and I love the light fragrance of the products. The Moroccan Argan Oil line is great for curly, frizzy, color treated, and damaged hair. I saw that Organix also sells lotion, I think I am going to give it a try as well. 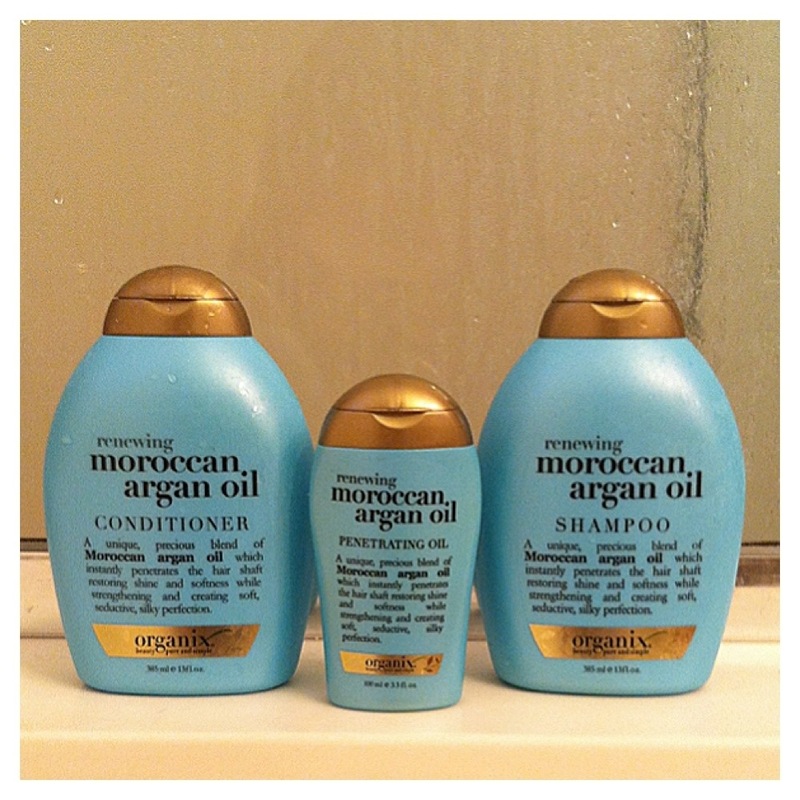 If you are looking for a fabulous, yet frugal hair product and aren’t willing to compromise on salon quality try out the Organix Moroccan Argan Oil line, you won’t be disappointed! Give it a try! Another curly hair tip is to comb in a little leave in conditioner while her hair is damp.